Please be informed that the Philippine Canine Club, Inc. (PCCI) is now accepting Certificate of Candidacy for the election of seven (7) Board Members Class 2021 at the Annual General Meeting of Voting Members & Election on May 18, 2019. Candidacy forms are available at the PCCI office. Deadline of filing of Certificate of Candidacy will be on April 3, 2019. Registration of dog with imporper coat color. Following the request of the Real Sociedad Canina de España (RSCE), the FCI General Committee decided to approve the change of the breed’s name, from “Dogo Canario” to “Presa Canario”. The new name will be valid as from 01/01/2019. The FCI breeds nomenclature and the breed standard (346) will be updated at the end of December 2018.
e) Freedom from fear and distress. Please be informed that the PCCI will be accepting dog registrations, membership, listings at the dog shows held in Metro Manila, Cavite and Pampanga. Your copy of the December 2016 issue of the PCCI Quarterly Magazine is now available at the PCCI office. Please click to read the full update from Atty. Christian Diaz. A Judge can handle dogs from group competition up to dog of the year but only in one (1) breed and as long as the dogs from that breed that he handles are either owned or co-owned by him. RESOLVED FURTHER, that Judges must inform the PCCI of the breed of their choice to handle from the group competition up to dog of the year every December of the year prior, provided that for the year 2018, Judges must inform the PCCI of their choice on or before January 17, 2018. In line with the said Standing Order of the Federation Cynologique Internationale (FCI), the Philippine Canine Club, Inc. (PCCI) is now accepting LISTING OF UNREGISTERED DOGS. As mentioned above, dog has to be examined by a judge approved for the breed in question; its breeding, from the fourth generation, can be entered in the studbook. Once approved, the dog must have a microchip identification. Other purebred dogs not recognized by the FCI. The above-mentioned breeds will be issued with a PCCI LISTING CERTIFICATE. They are qualified to participate in all PCCI and PCCI Affiliated Clubs dog shows (championship & performance events) and can earn championship points toward its PCCI Championship Title. However, these listed dogs are not qualified to earn CACIB certificates for international championship title. To have your dogs listed, just fill-out the Listing Application Form and pay the listing fee as prescribed by the PCCI Board of Directors. Listed dogs are required to be microchipped. Breeder of the Year per Breed – all the champions, grand champions and hall of fame in only one breed will be counted. National Breeder of the year - the breeder of the year by breed with the highest ranked by points. -All the champions, grand champions and hall of fame in only one breed will be counted. -The breeder of the year by breed with the highest ranked by points. - The points will be awarded to the owner of the primary kennel name used in registering the dog. - There will be Top 5 National Breeder of the Year awards. Please be informed that the PCCI Board of Directors has passed a resolution requiring all PCCI Judges to attend at least two (2) seminars every year as part of the judges’ development and in order to be able to have the privilege to judge the following year. Any change on the dog information as shown on the dogs(s) pedigree certificate. 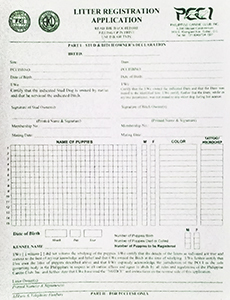 NOTE: Please email/fax to us the copy of the bank transaction receipt/deposit slip with your name and membership no.